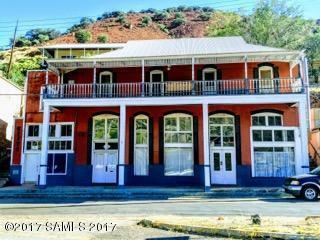 Historic Commercial/Residential in Downtown Old Bisbee offers Retail/Manufacturing/Office space downstairs and a spectacular living space upstairs. Downstairs could be divided into 3 separate spaces, with separate entrances on street level.Second floor residential space has entrance from courtyard behind building, original Douglas fir floors, high ceilings, and 300 sq. ft balcony overlooking downtown, mine and mountains.